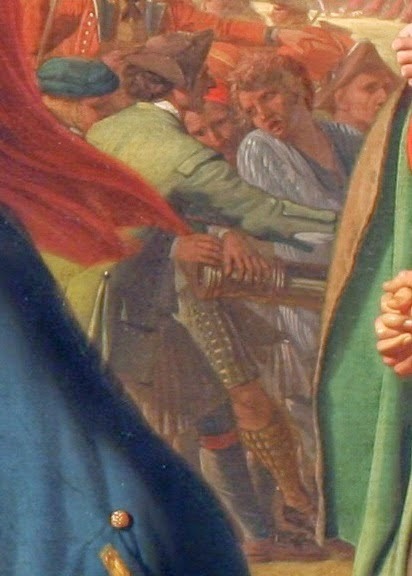 In yesterday's post on the famous 1770 Benjamin West painting The Death of General Wolfe, I identified the figure in green as a sailor. I confess that I originally thought him to be a ranger. For the uninitiated, rangers were trained in irregular warfare and light infantry tactics during the French and Indian War, proving an invaluable auxiliary to the regular forces deployed by the British throughout the Northern colonies and Canada. A blue skirt, or short petticoat of stuff, made with a waistband and one button ; this is open before, and does not extend quite to their knees. Knox's description sure seems to fit the figure above! I am indebted to Mr. Tramelli for his correction. For more on the rangers of the French and Indian War, check out the Jaeger's Battalion of Rogers' Rangers website.